Yesterday, 1 October I ran a webinar for the L&S Group. The slideset is below, and the points in the slides are elaborated beneath it. I have read every one of the entries – together with all the comments that have been left, and this year I can see 10 trends that I think are important for those working in workplace learning. Traditional e-learning authoring tools have a strong position on the list this year – undoubtedly due to the fact that vendors have encouraged their users to vote for them. However, they are in the main screen-based design tools – often PowerPoint-based – and promote a click-next approach to course design, which I’m sure you will agree is not seen as engaging e-learning. But there is now a range of new tools appearing on the list that are being used to create more exciting, richer, more visual content. From tools – (like Piktochart (new in at 93) and Canva (new in at – to create simple and effective infographics, to animated explainers that build content along a timeline, i.e. Powtoon (new on the list in 2014 and up to 19 this year), Videoscribe (new in at 48), GoAnimate (new in at 63) and Explain Everything – an app for iOS, Android and Windows devices (new on the list in 2014 and up to 47 this year). In fact, Microsoft has another new tool on the list this year, an online app called Sway (in at 70) which lets you embed a variety of different types of content – images, videos, Mixes, etc – to create a more engaging resource. YouTube has had a very good year in 2015 – up to 2nd position – and very close behind Twitter. Tools that support the creation of video-based lessons (ie enriching existing videos) are also very popular and continue to do well. TED Ed (at 35) lets you create a lesson around TED Talks and other videos. EDpuzzle (at 85) lets you take any video off the web, edit it, add notes and questions. And what’s more video editing tools are back on the list again this year. iMovie (for Macs) is back in at 76, and MovieMaker (for Windows) is back in at 78. Another trend I have been noticing over the last few years is the shift from course management to course networking. This has been more obvious in education, where traditional educational course management platforms are considered to be showing their age. 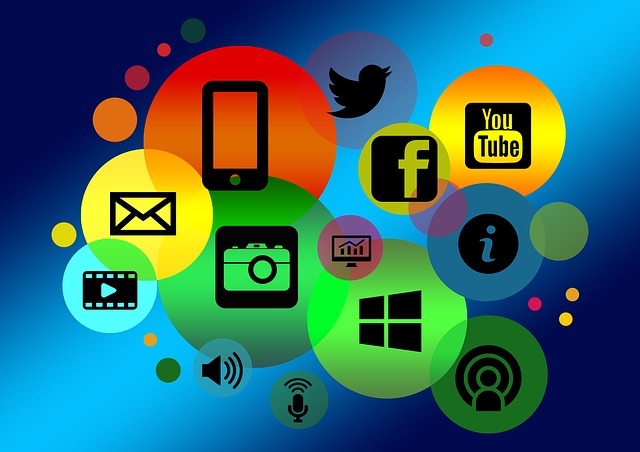 So there is growing interest in 21st platforms – which provide a more social networking environment. Canvas, for instance moved up the list 41 places this year, and Schoology was up 37 places. Free Edmodo has been around since 2010. As for the workplace, well, pure-play enterprise LMS have never appeared on the list in its 9 year history – which probably says something in itself! But now I can see a small shift happening, where organisations are moving some of their formal learning initiatives out of the LMS altogether and hosting courses in their internal social collaboration platforms like Yammer or SharePoint (which incidentally has risen considerably on the list this year) rather than in a dedicated learning platform. In this way, the focus is more on conversation and knowledge sharing rather than the authoritative voice, and in the very same platform people use for work, meaning these discussions can take place in the flow of work – and not in a separate “social learning” system. The classroom and training room is becoming more social too. Both teachers and trainers are increasing using new tools to move from a broadcast to a participative or collaborative experience. Kahoot – a game-based classroom response system – for schools, universities and businesses – moved up the list 64 places this year to be the highest climber, whilst Socrative, a student response system that lets teachers engage with their classes through a series of educational exercises and games via smartphones, laptops, and tablets, has also moved up 40 places this year. Mentimeter (new on the list list year) and Poll Everywhere are general purpose tools that let presenters and trainers engage and interact with their audience in real-time. You set the questions and your audience can give their input via a mobile phone or any other Internet connected device. Nearpod is a bit more substantial. It lets you create presentations, sync their delivery, or provide them on demand, together with questions and assessment. It is tool primarily for the education market but it is being used in corporates too. TodaysMeet lets you set up a private backchannel for any event. A number of MOOC (online learning) platforms appear on the list this year. Coursera appeared on the list for the first time last year, and has been joined by Udemy and edX this year. The interesting thing to note, is that they are not just a source of self-organised professional learning but they are getting the seal of approval from training departments who are recommending online courses to their people. Something I’ve been noticing in other organizations that I’ve worked with around the world too. In fact for many people nowadays, having a PLN (Personal or Professional Learning Network) Is an essential aspect of learning in today’s world – whether it be on Twitter, Facebook, LinkedIn, Google Plus – or all of them! But of course many people turn to the Web for help on many other occasions. This year, as in previous years, it is clear that more and more people sort out their own problems online as it is just so much easier and quicker to find what they want, in the format that suits them best. They just want to solve their problem and get on with their life; they don’t want to have to take a test to know if they’ve got it right – they know if they’ve got it right cos it solves their problem. And they don’t need to remember it all either, just where to find the solution again – if they need it. So, this is where tools like Google, YouTube, Wikipedia, Slideshare, Google Maps, Google Translate and so forth come in – and why they are considered to be such important learning tools, and rank high on the list. (7) Sharing is the new saving! Sharing is so easy nowadays … it’s just one click away. Everything is shareable – Whether it be personal notes – in Evernote or OneNote; blog and web feeds that you subscribe to in Feedly, or stuff that you save to read later in Pocket. Those who have been active on the Social Web understand the value of sharing but others often need help and encouragement to do so – particularly those who think “knowledge is power”. However, it’s also important to recognise that over-sharing is as bad as no sharing, so skills in discrimination in sharing are also required..
(8) Connecting and collaborating are king! In terms of connecting and conversing, real-time messaging services have become extremely popular, Skype (has moved back up to 9th place) and WhatsApp has climbed 62 places up to No 21. WhatsApp (with nearly 1 billion users worldwide) is not just for 1-1 messaging but also group conversations. And of course enterprise social platforms like Google Apps for Work (independently customizable versions of several Google products under a custom domain name), Yammer and SharePoint are rated highly too. This is where the REAL social learning takes place – when groups organise themselves to work together using collaboration tools for a purpose. iPads (at 16) with the huge range of apps available for them makes them not just useful as personal learning device or a performance support tool (sometimes to circumvent enterprise systems that block online tools and service) but also as a recognised classroom or training tool, as well as an enterprise tool. In fact many companies are now providing them to their people and loading them with tools to enable sharing of resources in corporate platforms. 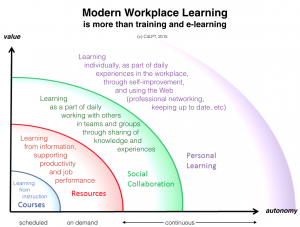 So what does this all mean for workplace learning? from courses (instruction) – when we are taught in the classroom, online (aka e-learning) or in on-the-job programmes. This type of learning is organised for us, and structured into courses, classes, lessons, etc. from a variety of resources (performance support) – which we access to support our productivity or job performance. through personal daily experiences at work, as well as though planned, self-improvement activities that often include use of the Web for professional networking, and so forth. 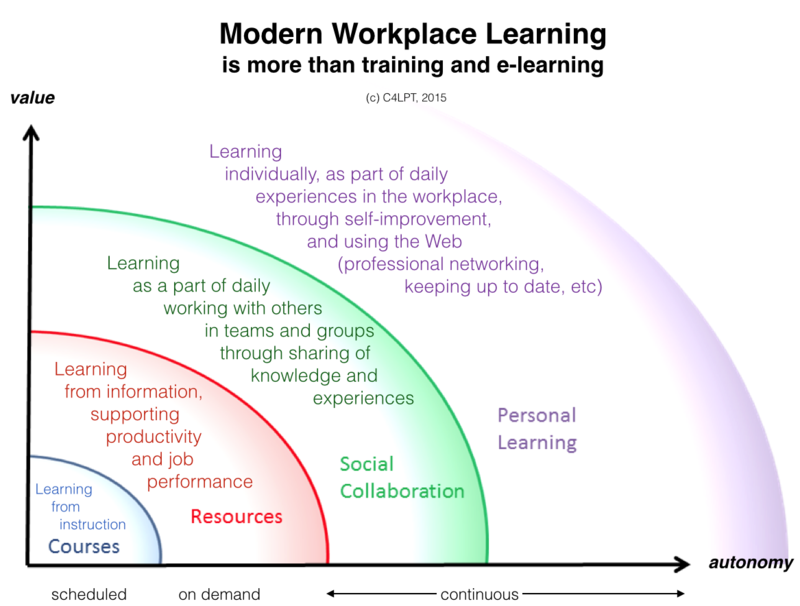 In the modern workplace, learning is part scheduled, part on demand, but largely a continuous process, and most learning happens outside courses, as people go about their daily work. This type of learning is very different from the traditional learning that takes place through studying or training – but it is this learning that ensures our personal and professional – and indeed organisational – survival. It is also clear from other studies (including my own Learning int he Workplace survey) that the more autonomy individuals have when learning, the more value they place on those experiences. To put it another way, learning in the modern workplace is both an organized and self-organised activity. For L&D this means, that there whilst there will still be a need to organize and manage some training activities in a fairly prescribed way, it provides the opportunity to create learning content and experiences in more flexible ways by offering on demand access to courses and resources and enabling their use in the ways that best suits individuals, and there is a new opportunity to enable and support the self-organised, continuous learning and performance improvement of teams and individuals. L&D’s role in the modern workplace therefore involves TWO types of work: providing modern training and promoting everyday learning. 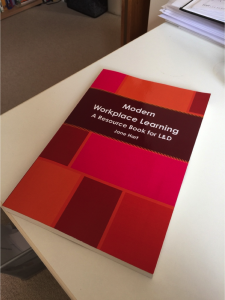 If you would like to find out more about Modern Workplace Learning, my new book is now available to purchase as a paperback or PDF. Part A of the book provides an introduction to Modern Workplace Learning. It considers the factors influencing a change in the way we understand workplace learning, and what MWL looks like in practice and what it means for an organization.